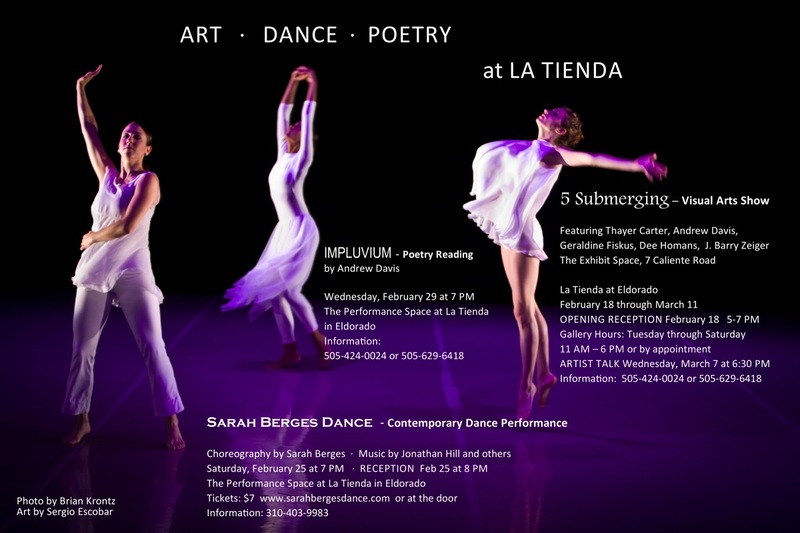 Sarah Berges Dance PERFORMS inSanta Fe! Sarah Berges Dance will join selected Santa Fe dancers to perform a new work choreographed by Sarah Berges entitled “Repeating the Past.” In response to the magnificent new sculpture by Dee Homans, on display in The Exhibit Space at La TIenda (2/18-3/11), the dance reflects the aggressive power of the sculpture in contrast to its undulating, lyric subtext. Ancient memories of the Medea story rise and fall in the dance, a touchstone for reflecting on modern day acts of vengeance and of violence used against innocents. SARAH BERGES DANCE will also perform “Vignettes” – small dances at odd times – in The Exhibit Space at La Tienda. These 4 minute dances will be performed once a day, Wednesday 2/22 through Saturday 2/25 (call 310-403-9983 for precise times.) Admission to the “Vignettes” is free of charge. Based in Oakland California, Sarah Berges has been producing dance since 1984. During the 15 years she spent in Los Angeles (1996-2011) Ms. Berges founded a modern dance company and a ballet company. Her companies have performed in Mexico, Costa Rica, San Francisco, the Los Angeles area and New York City. Recipient of grants from Culver City, SONY Pictures, the Puffin Foundation and Squid & Squash Foundation, Ms. Berges has used grant money to produce dance in public, outdoor spaces. Her “Adventure In Wonderland” attracted large audiences at Culver City Park and charmed students at Los Angeles middle schools. Sarah Berges’ choreography springs from her childhood training in improvisation and choreography. Ms. Berges’ lifetime in dance – performing, teaching, and exploring movement – culminates in a choreographic style that is classically patterned yet full of twists and turns. Always intent on telling a story, her dances are informed by a graphic sensibility bolstered by raw emotion. This entry was posted in Performing Arts and tagged Dance performance, performance space. Bookmark the permalink.